Fact: pizza is good. Another fact: there can never be "too many" pizza establishments in a city. Mission Pizza has done a tremendous job garnering cult followers since they opened in downtown Winston-Salem on Trade Street in January. On my visit, I got to order from their recently updated menu - which was mostly awesome - but everyone I've spoken to is totally gaga over this joint. Mission is Winston's premiere Neapolitan pizza place, and as I approach the one year anniversary of my trip to Italy, it sure made for a nostalgic dining experience! Enjoy a Summer Basil Beer from Fullsteam Brewery in Durham while it's still in season. It's garnished with a Basil leaf the size of your face. 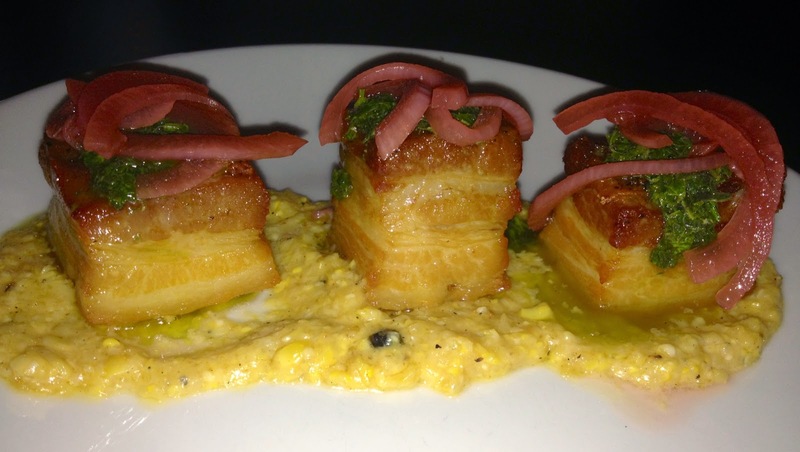 The description of the Pork Belly appetizer sounded scrumptious - three chunks of the savory meat on a bed of Sweet Corn Puree, with Salsa Verde and Pickled Onions. It's best to not try and undertake Pork Belly unless you are absolutely positive you're not going to overcook it. The accompaniments were a treat on their own, but unfortunately, the Pork Belly was impossibly chewy, and I had to get caveman style with my knife and fork to try and cut it. I appreciate the vision here, though. Head Chef Reggie and me! As far as appetizers go, you'd be crazy to not try the Shrimp Arrabiata, a bowlful of 8 or so tender shrimp in a not-too-spicy, tomato-based sauce, with notes of Bacon and Parmesan. It's utterly delicious. Save some of the sauce (if you can!) to dip your pizza crust in! If Head Chef Reggie is working, he might hook you up with this dish as a treat. He knows it's a hit and surprise(!) a good way to ensure repeat customers is to give them free food. Pizzas are about 12 inches round, and cut into 4 large wedges. 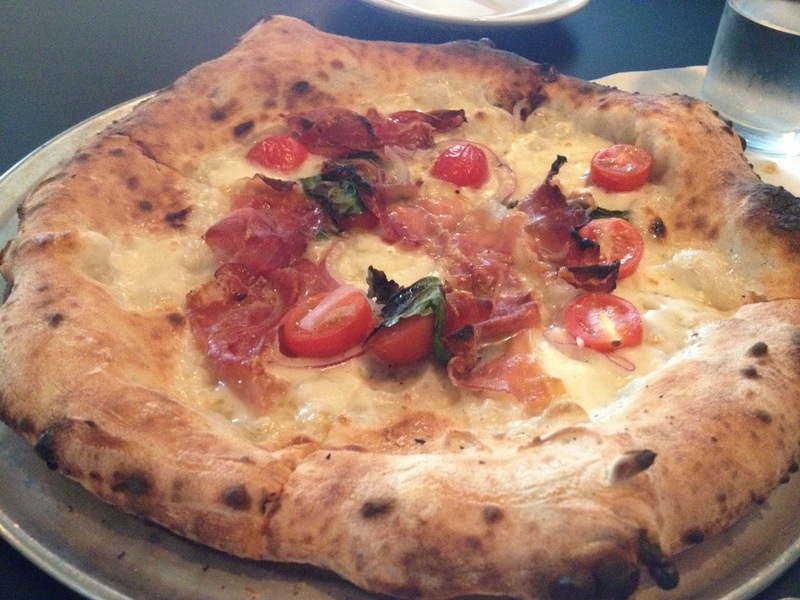 The Speck Pizza was suggested to us by our server, mainly because of the Smoked Prosciutto, which tasted like an extra salty bacon. Burrata, Arugula and Cherry Tomatoes are modest toppings, but the lack of tomato sauce was kind of a disappointment for me. I'm definitely a red-sauce based pizza kind of gal. Luckily we had saved some of the Arrabiata sauce! 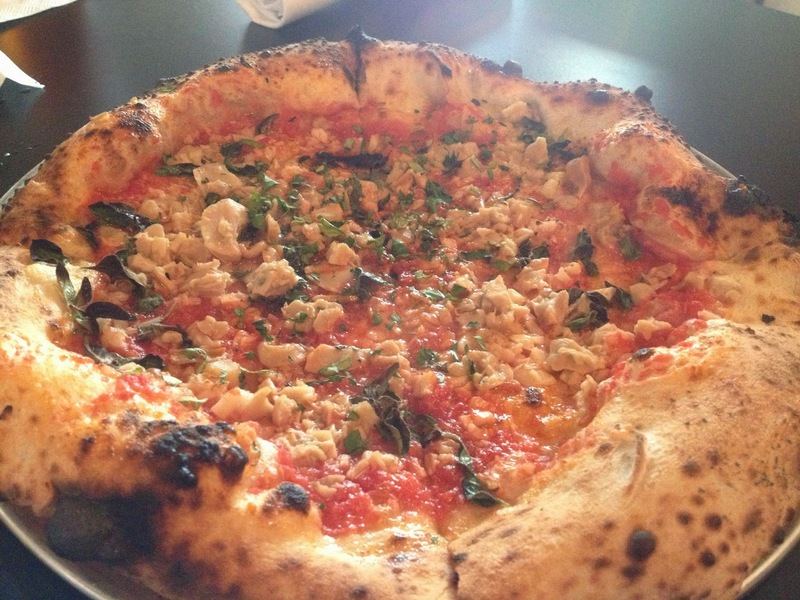 You must - absolutely MUST - order the Red Clam Pizza, a tip of the hat to the famous New Haven-style pie. I could have never imagined these flavors together! Fresh Clams, Basil and Lemon on a tomato-based crust is bright, mouth-watering and has great texture. Every pizza place on the planet needs to have a rendition of this. Mission Pizza is in a perfect location to continue expanding the Arts District (right next to District Rooftop Bar and Grille, in fact!). I'm really happy with the success they're having.